Sarkin Gagi, Alhaji Umar Jabbi with his newborn baby. In his hand is a Chlorhexidine gel which is being applied on the boy's unbiblical cord area. Gagi community on the outskirts of Sokoto in Northern Nigeria is a settlement where everyone knows each other. Modern and traditional style buildings sit side by side. People are gathered in groups in what is popularly known as 'Majalisa', or council on either side of the road, in between clusters of shops and houses. One of the roads leads to the house of the traditional leader of the community, Sani Umar Jabbi. Umar's seven-day-old son, little Jabbi, was born in a spacious, well-equipped delivery room that was built with support from United Nations Population Fund (UNFPA) to attract Gagi women to attend antenatal and hospital delivery in the primary health centre at the heart of the community. Little Jabbi is also a beneficiary of a gel that is saving lives of new-borns: chlorhexidine gel. Chlorhexidine is an antiseptic gel that has been proven to reduce the incidence of neonatal mortality by about 23% when used in and around the umbilical cord of a newborn for a number of days after birth. Neonatal mortality is one in the series of Nigeria's poor health indices. According to the latest WHO data, neonatal mortality rate still stands at 32.9 per 1000 births. There are three major causes of neonatal mortality; infections, pre-term births, and birth asphyxia. The umbilical cord is a fertile site for infection in a neonate, especially if exposed to unhealthy particles such as cow dung and charcoal, as it is the practice especially in some communities. When chlorhexidine was added to the WHO essential medicine list for children, Sokoto State became the first state Government in Nigeria to officially launch the use of Chlorhexidine gel in 2013, preceding the Federal Ministry of Health's National Policy on the Scale-up of Chlorhexidine, written in 2016. The traditionally conservative culture of Sokoto State sometimes creates a context of reluctance to accept new healthcare interventions. Yet, Chlorhexidine has been shown to record remarkable good acceptance in the state. Chlorhexidine for prevention of sepsis in neonates was first introduced in Sokoto and Bauchi states in In 2010, under the Targeted State High Impact Project (TSHIP) program supported by the United States Agency for International Development. The TSHIP program rounded up in 2015, but its gains have been sustained by the Sokoto state government, a great example of sustainability of and successful transition of donor-funded programmes in Nigeria. The Reproductive, Maternal and New-born Health Coordinator in Sokoto state's Ministry of Health, Hajiya Mairo Sherrif, explains that people in Sokoto have largely been able to accept chlorhexidine as a result of the buy-in of a group of important gate-keepers; traditional and religious leaders. These gatekeepers often function as the eyes and ears of the people, and can hold the key to their actions. In Sokoto they have been able to influence behaviour change in terms of neonatal health, by getting people to stop age-old practices including using cow dung and charcoal to promote healing in the umbilical cord after birth. 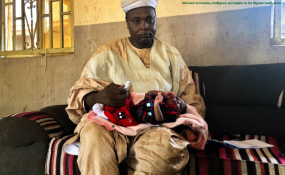 The Sarkin Gagi, who doubles as the head of the Jama'atul Nasrul Islam technical aid group, said the turning point in his community was getting women to accept antenatal care and delivery in hospitals or primary health centres. To achieve this, they employed three strategies; convincing men of the value of this through sermons in the mosques and community meetings; female community health volunteers going from house-to-house to sensitize women on the importance of antenatal care and hospital delivery; and finally making the delivery process in the hospital to conform with their culture and tradition. One key factor was for women not to be attended to by a male health worker and things as simple as accepting their preference to lay on a mat instead of a bed. To address these concerns, the community built a two-bedroom apartment beside the antenatal and delivery unit of their primary health centre and requested for a permanent female midwife to be posted to the facility. The community also bought large mats for the delivery room to enable women to deliver in the way they are most familiar. Sarkin Gagi says that the major goal is to have the women deliver their babies with the help of a skilled health worker. Zainab Abubakar, a midwife at the PHC, explained how these strategies have helped increase attendance in the PHC, as 49 deliveries were recorded in September 2018 compared to an average of 4 deliveries per month over the previous years. More deliveries at the facility means more babies receiving chlorhexidine, more children surviving and more women telling their stories! Chlorhexidine gel does not only prevent infections in neonates, it promotes faster healing of the umbilical cord. Immediately a baby is born, after cutting the umbilical cord, chlorhexidine gel is immediately applied around the area. This is then given to the mothers upon discharge to continue the application of the gel for four to seven days. Zainab Mohammed, a resident of Gagi whose second daughter, Saudat, had the gel applied after birth. She noticed the difference as Saudat's umbilical cord area was completely healed within three days as opposed to her first daughter's which she said took more than seven days to heal after she used a cloth soaked with warm water to massage the area. Zubairu Mohammed Gagi, says chlorhexidine gel was used on his fifth child, 16-month-old Habibu, and his cord healed faster than his other children whom the gel was not used on. In Bodoi village in Dange Shuni Local Government Area, about 60 kilometres from Sokoto, Village head Muhammad Gamau is so convinced about the value of the gel that he distributes it to traditional birth attendants whenever health officials from the local government supply the commodity. Having health infrastructure is critical in providing healthcare services. But getting people to make use of those infrastructures is even more important. With Sokoto state's antenatal care coverage at 35.1% and facility delivery at just 12.3% according to a recent Multiple Indicator Cluster Survey, concerted efforts are critical to increase those numbers. This is where the work of the female Community Based Health Volunteers (CBHVs) come in. There are about 10 CBHVs in Gagi community, and most of them used to be traditional birth attendants who now work on sensitization for antenatal and facility delivery, working to get pregnant women to deliver at the PHC. If a woman delivers at home before getting to the clinic, the nearest CBHV applies the chlorhexidine gel on the new-born after the umbilical cord has been cut and teaches the mother how to apply it subsequently. Every CBHV has a stock of Chlorhexidine gel given to them through the district head, but Gagi's Head of CBHVs, Jummai Mohammed says they rarely get use them as almost every woman in the community now delivers at their primary health centre. However, care must be taken in the way chlorhexidine gel is being distributed to the CBHVs and mothers so as to avoid the unfortunate scenario that happened with the gel in Yobe state in 2015 where the inappropriate use of chlorhexidine gel led to unfortunate outcomes. A system should be in place to retrieve unfinished chlorhexidine gel from mothers to prevent their accidental use for other purposes or accidents by children. Gagi has also helped increase delivery at the primary health centre by putting in place a health financing mechanism. The fear of out of pocket payments of antenatal and delivery no longer exists, as the community runs a Community Based Health Insurance Scheme, which every household in the community is a member. Sokoto state seems to be exploring sustainable, innovative, and context-driven methods to drive critical change in the area of neonatal health. Gagi is an admirable example of a community's courage and determination to improve both maternal and child health. Through the use of traditional and religious leaders, community-based health volunteers, a community-based health financing mechanism and adapting modern methods to embrace traditional mores, the community has been able to make life-saving chlorhexidine gel acceptable. The fact that Sokoto state has worked to sustain such a critical intervention is also a challenge to other states in Nigeria, a challenge that useful health interventions such as this one can and should be sustained if we must bring down our daunting health statistics. Copyright © 2018 Nigeria Health Watch. All rights reserved. Distributed by AllAfrica Global Media (allAfrica.com). To contact the copyright holder directly for corrections — or for permission to republish or make other authorized use of this material, click here.